Why carry out emergency light testing? BS5266 recommends that emergency lighting systems be regularly serviced by ‘competant’ persons, these being persons with the necessary knowledge, skills and training to undertake emergency lighting servicing procedures. Implementation of a periodic system of inspection and testing ensures that emergency lighting systems remain reliable at all times and that in the event of an emergency or power failure, the emergency lighting operates, ensuring that people can safely evacuate the building. If you have 5 or more employees, you are required by law (under The Regulatory Reform (Fire Safety) Order) to carry out a fire safety risk assessment. Daily – visual check to ensure that emergency lighting systems are operating correctly and that indicators are working. This will be carried out by the ‘responsible person’ delegated to the task by the organisation/business. Any faults should be logged and corrected asap. Monthly – Check all luminaires for signs of damage or disrepair. 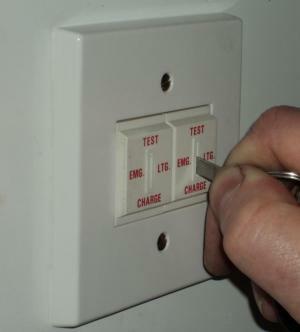 Briefly test all emergency lights to ensure that they operate in the event of mains electricity supply failure. This will usually be carried out by the ‘responsible person’. Any faults should be logged and corrected asap. Annually – A full system inspection and duration test of the emergency lights should be performed by a ‘competent person’, this being a person with the necessary skills, training and knowledge to perform emergency lighting maintenance and servicing. Compliance with BS5266 should be considered and produced in the emergency lighting certification report. Any faults should be rectified. Why choose Elec Cert Ltd?